a large number of people were turned away at the door. By the time that I arrived at the Harvard Science Center at 6:25 p.m., the line for the "Science and Cooking" lecture had already snaked its way around the entire ground floor of the building. Wondering if there would be enough room in the hall for everyone, a woman mentioned overhearing that the people at the front of the line had been waiting since 5:00 p.m. for Grant Achatz, one of the world's great chefs to deliver his lecture, "Food Texture and Mouth Feel". With a coveted three-star Michelin ranking, Alinea restaurant in Chicago offers "exceptional cuisine, worth a special journey." The residents of New England seem to agree because I met a chef who had traveled from Rhode Island to hear Achatz's lecture and to ask him to sign his copy of Alinea, the cookbook showcasing Achatz's cuisine. Renowned for his relentless pursuit of innovation and for playing with flavor and scents, Grant Achatz was invited to speak at the Harvard School of Engineering and Applied Sciences (SEAS) as part of the general education course, “Science and Cooking: From Haute Cuisine to the Science of Soft Matter,” that is offered to Harvard undergraduates. Using food and cooking to explain fundamental principles in applied physics and engineering, the lectures by Harvard researchers and world-class chefs are open to the public on a first come, first seated basis. The evening started with a brief lecture by Professor David Weitz, who explained that "mouthfeel" is the combination of elasticity, viscosity, yielding and plasticity. Using spaghetti and ramen noodles, Weitz illustrated that viscosity is related to elasticity by a time-scale and presented the equation of the week, which was met by an enthusiastic round of applause! Equation of the Week - thank goodness that there wasn't a test at the end of the presentation! After a brief introduction, Grant Achatz presented Craig Schoettler, who presides over the kitchen of the recently opened Aviary, a cocktail lounge where the two chefs are using what they have learned in gastronomy to change the way that we think about cocktails. Schoettler challenged the audience to think outside of the box by asking if cocktails have to be served in a glass and if they have to be liquid. pineapple compressed with green Chartreuse. Achatz and Schoettler's enthusiasm for their futuristic cocktails was so contagious that I found myself wanting to jump on a plane bound for Chicago so that I could try some of their avant-garde creations, like an Old Fashioned that is served in an ice balloon that must be shattered before the contents can spill out into the glass. Schoettler's goal is to create an experience where customers have a vested interest in their cocktails because they're required to "do something" with them. 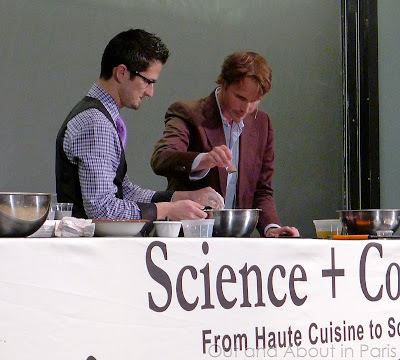 Chefs Craig Schoettler and Grant Achatz standing next to the rotary evaporator (roto-vap) that can extract flavor and aroma from food without cooking. We found samples of Fresno chili (red jalapeno pepper) distillation in a little plastic container in the take-out boxes under our seats. It tasted pleasantly of pepper without the heat. When one of the Harvard undergraduates inquired if there are any problems that they're still trying to solve, Achatz revealed that they would like to figure out how to layer cocktail ingredients vertically rather than horizontally, how to make snow and how to create ice that sinks rather than floats. Since all of Professor Weitz's students have to submit a project at the end of the semester, there's a good chance that you'll be sipping a vertically layered cocktail at Aviary in the near future! As I had a bit of time to talk with Grant Achatz while he was signing books, I asked him about his favorite restaurants in Paris. Without any hesitation, he recommended Yam'Tcha and chez l'Ami Jean. Many thanks to Sara and Rene for telling me about the chef lectures at Harvard. Rene, I'm sorry that you weren't able to attend Grant Achatz's lecture because it was amazing! Excellent reporting, and obviously some note-taking as well. The Equation of the Week is brilliant. I have not yet gone to the Aviary, I'm just not wired to be the first. Maybe next year. Although I keep going back to the Pump Room and it's officially not even open yet, so go figure. But do tell, when did you get in line for your seat? Joseph, When you do go to Aviary (which got its name because Grant Achatz likes the sound of it and it starts with "A" like Alinea), please write a blog post about it and take pictures. I wasn't kidding when I said that I was tempted to get on a plane and try some of their cocktails - and I usually only drink wine! I was in line at around 6:25 and was one of the last people that they let through the door after they held me back for a few minutes to make sure that there was still room. I was in a bit of a panic thinking that I wouldn't get inside. Luck was in my favor though because I was able to have a seat in the front row. Unfortunately, they had to turn away a lot of people due to lack of space. I bought a copy of Achatz's biography and cookbook. Very interesting! Thanks so much for writing about Grant Achatz's talk! I've really enjoyed going to the Science and Cooking lecture series, and I was disappointed that I wasn't able to make it to this one. I'm glad that I was able to see your pictures and read about it while I'm at sea. The roto-vap has some neat culinary applications and makes it possible to achieve some really interesting flavor/odor combinations! At the first Science and Cooking lecture, Joan Roca described how his restaurant used it to extract flavors from dirt to give an earthy taste to one of his dishes. It's awesome that you were able to see (and taste) the distillation process first hand! Rene, The roto-vap is amazing. Grant Achatz mentioned that another chef was using it to extract the flavor of dirt and leather (I think) but he didn't tell us the name of the chef. It's interesting that it was Joan Roca and that you were able to listen to him. Achatz said that the roto-vaps cost about $10,000 and that there are about 10 of them being used in restaurants in the States. Achatz has 3 of those 10! 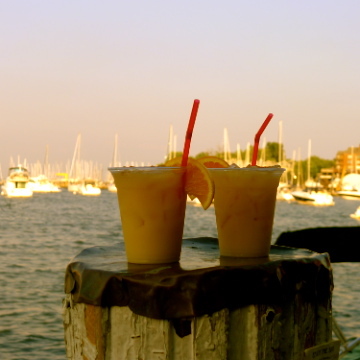 He showed us pictures of one of their cocktails that tastes like a root beer float but looks exactly like a glass of ice water thanks to the roto-vap. It's mind boggling! Achatz lectured at Harvard last year so hopefully it's an annual event that you'll be able to go to next year when you're not at sea. Front row--so that's how you got such up-close-and-personal photos. I thought you had gone all journalistic on us and walked around during the lecture in order to get the image. So that was good luck on your behalf. Let me know if you like shoes and I'll add another photo to the post. Grant Achatz was wearing some that caught my attention and that of another blogger who was trying to figure out if they were John Fluevog shoes.